Late risers can probably relate to the following scenario: after hitting the snooze button at least three times before finally wrestling your half-asleep body out of bed, you end up squeezing your morning routine into a very narrow window of time. As a courtesy to others—particularly those who might have to smell your B.O. in a jam-packed commuter train—you ditch a proper, healthy breakfast in favor of a refreshing morning shower. This wakes you up, of course. But it doesn’t do much for your hunger. How to solve this quandary? 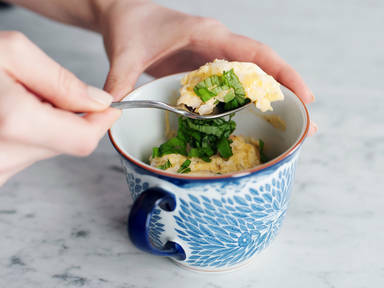 You have two options: grab an overpriced, on-the-go sandwich or chef up a quick, delightfully delish breakfast treat in the form of scrambled eggs in a cup with shallots, bacon, and fresh basil. Check out the full recipe in the video.